You write the most beautiful content. You make sure it’s shared on social media. And you have an excellent website. Even so, the likes, shares, and engagement from your target audience are lacking. Sounds familiar? You’re likely making readability too tricky. The Common European Framework of Reference (CEFR) can help make your content more readable. Helping you boost those likes, shares, and engagements! The CEFR recognizes six language proficiency levels, from breakthrough (beginners) to mastery (the level that closely matches native speakers and writers). The European Parliament reached an agreement about a new law. This law intends to make government websites more accessible by writing all text at the B1 level. A great idea. Not only for those likes, shares, and engagements, but also for your search engine optimization (SEO). Implement it on your company website and discover the difference it makes! But what does the CEFR recommend exactly and how should you put it into practice? Webtexttool explains it all in this article. A1 and A2: the basic user. A1: the language is very simple. The sentences are often separated by breaks. A2: the language is simple. The words are highly frequent, known from one’s own language or belonging to international vocabulary. The sentences are often separated by breaks. B1 and B2: the independent user. B1: this involves straightforward standard language. Within one’s own area of expertise or interest. More complex language use is generally understood. B2: the use of language is more complex. C1 and C2: the proficient user. C1: vocabulary and grammatical construction are complex. Idioms and implicit meanings are understood. C2: the language is complex. Idioms and unclear sentence structures without explicit signal words are effortlessly understood. Of course, everyone has a different opinion about easy-to-understand language. But how do you put that to work in your company’s blog posts and articles? 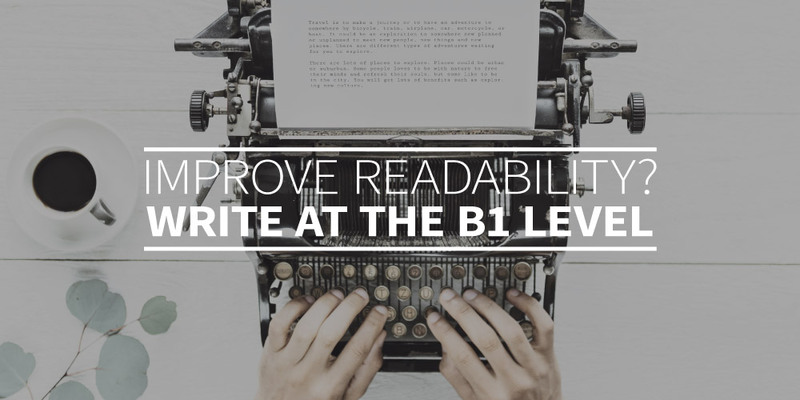 Writing at a B1 level will allow you to reach an audience that’s as broad as possible. There are naturally certain exceptions to the guidelines. If you’re writing explicitly for readers with a higher education level. Or producing a piece aimed at an audience of legal professionals. Then you’ll need to write with more complexity. If you don’t have a doctorate or a legal degree, it’s best to aim for a wider audience by writing at a B1 level. The larger the group of people able grasp your content, the greater the chance that they’ll purchase your products or services. In order to write at an understandable level for your target audience, the most straightforward way to test your content is to let members of your audience read it first. Ask them whether they understand what you’re communicating and which areas might need clarification or rewriting. Once you’ve done that a few times, any future content will be much easier to write at the appropriate reading level. In the first place, you’re writing for your target audience. But it’s also important that Google understands you. So the search engine can scan your content and include it in relevant search results. Google understands the B1 level, simply because about 80% of users have at least that level of language proficiency. That means that many search queries are entered at a B1 level. When you offer up a B1 answer for a B1 question, it’s clear to Google: you understand your target audience. When you write copy in webtexttool, you’ll get instant tips to optimize your content for Google. That means you don’t need any prior knowledge of SEO, we’ll simply sort that part out for you. Live! Wonder what webtexttool can do for your content at a B1 level (as well as all other levels)? Try it for free for 30 days!